The building on Queens Boulevard and 60th Street is believed to have housed a Childs Restaurant. WOODSIDE — A push is underway to landmark a local building that's thought to have once housed a Childs restaurant — the second Queens building associated with the early dining chain to catch the attention of preservationists this month. 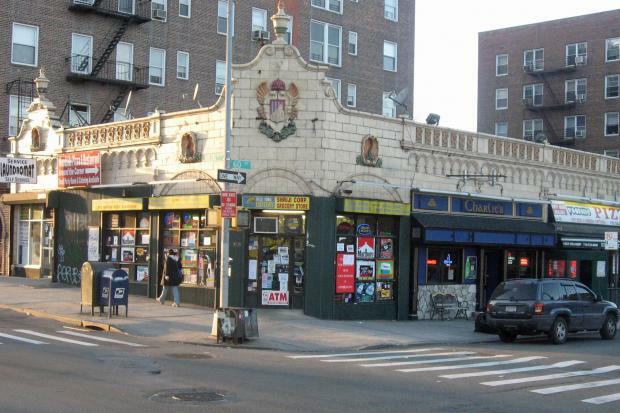 Filmmaker Lisa Hurwitz submitted a request Saturday to the Landmarks Preservation Commission to evaluate 59-37 Queens Blvd. for potential landmarking. The history of the property and its decorative terra cotta facade deserve to be preserved, she says in her petition. Her request comes alongside another submitted this week by the Greater Astoria Historical Society, which asked LPC to landmark a similar-looking building in Astoria that's also believed to be a former Childs eatery. Construction crews are currently doing alterations at the Astoria location, and the future of its distinctive exterior is still unclear. It's that project that inspired Hurwitz to rally for the Woodside building, located at the corner of Queens Boulevard and 60th Street. "I'm scared, and I think a lot of people might be scared too, that it might be too late for the Astoria location," she said. "I wanted to be proactive." Both buildings bear colorful terra cotta facades featuring nautical-themed figures like seashells and seahorses, similar to other former Childs' buildings, including its most famous location at Coney Island, which is a city landmark. "It's very strong evidence that there is a Childs connection," said Bob Singleton of the Greater Astoria Historical Society, who is planning a community meeting Wednesday night about preserving the Astoria site. The Childs restaurant chain launched with its first location in lower Manhattan in 1889, expanding to include more than 100 locations by 1925, according to a report by the LPC. Hurwitz, who has researched early restaurant chains for a documentary film she's making about Horn & Hardart automats — another famous and now-defunct eatery — says Childs was a dining "empire" responsible for popularizing cafeteria-style service. "We need to have places like that that remind us of our past," she said. "It's beautiful. It's a part of our history." While several former Childs locations are believed to still exist around the city, Hurwitz thinks these two Queens sites are "the most obvious for landmarking." "They're the most intact, they have the most terra cotta, they're very colorful," she said. The city's zoning map shows the Woodside building was built in 1931, though Department of Buildings records for the site include a Certificate of Occupancy dating back to 1929. The building is currently home to a bar, a pizza place and a laundromat. It was purchased in January by JMDV Woodside LLC for $3.2 million, city records show. Attempts to reach the owner of the property were not immediately successful Tuesday. A spokeswoman for the LPC said it's currently reviewing Hurwitz's request.